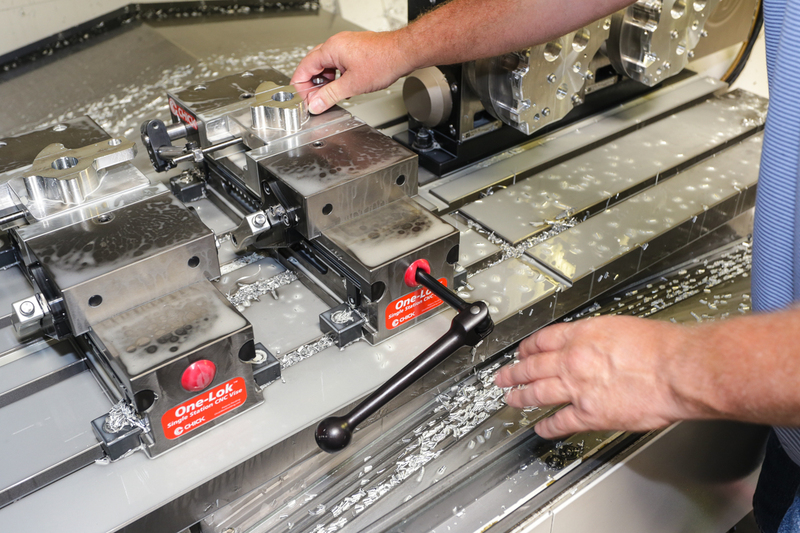 Right on target with upgraded machines and intuitive workholdings – Arrow Machine Industries Inc.
Arrow Machine Industries has a variety of workholding solutions from Chick. The OneLOK system works well in small batch manufacturing. On short runs the process is controlled less by how fast the machine is, and more by how fast the machinist is. 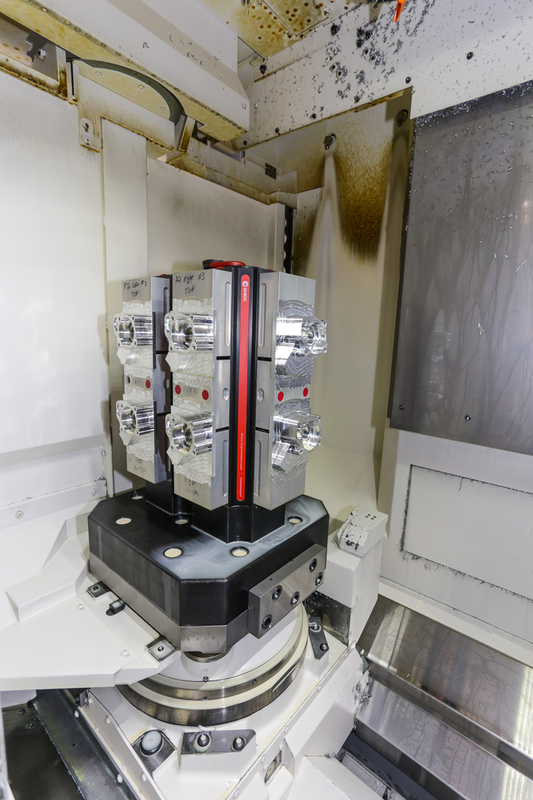 You can change jaws with a single turn of a t-wrench and repeatability of 2 tenths (.0002). The fully sealed bed keeps chips out. Arrow Machine Industries Inc. is a family owned manufacturing center in El Cajon, Ca. They made a name for themselves in underwater camera and Sonar housings. Today, they have a more surf and turf approach to manufacturing, splitting time between Harley Davidson parts and underwater items. Scott went to work at Fourward Machine as a CNC programmer. “I told them I was a CNC programmer and that’s what they hired me as,” explains Scott. 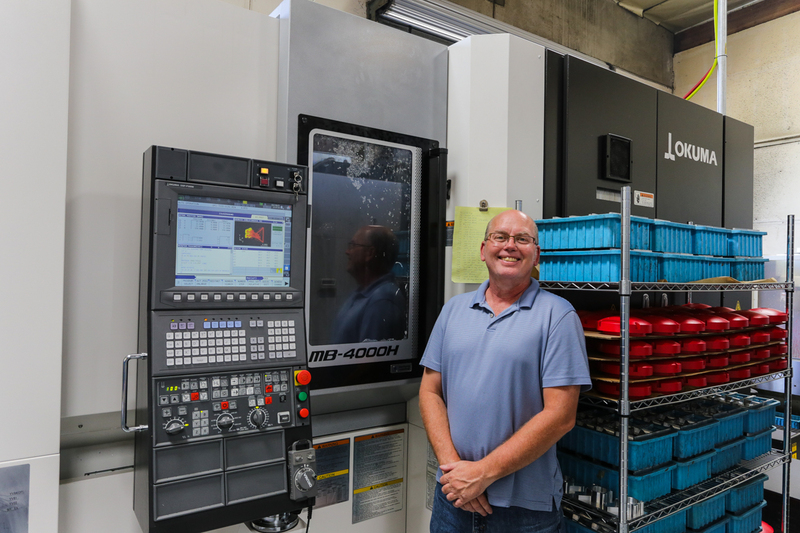 “Of course, my CNC programming experience came from sweeping floors, loading parts, unloading parts and loading the program into Shizouka knee mills with Bandit controls. I figured I had learned enough from watching the bosses and programmers do their job.” He was in way over his head, but came in early and stayed late off the clock to get things done. The bosses liked his effort and he had a key to the shop. He spent an entire weekend working for free because he couldn’t figure out how to get the machine to drill holes. He could get it in position, but manually had to raise and lower the table to do the drilling. “It was a simple task that even a basic CNC programmer would know,” laughs Scott. “I worked for them 14 years and most of that time I figured I had got away with the fib. Turns out they knew all the time, but appreciated my hard effort.” The end result was that Scott became a pretty good programmer. The Hardinge Bridgeport has only been in service for a couple months. The new machine with Chick Foundation and QwikLOKs have netted huge production gains. For most, a single revelation in production throughout their career is all that can be hoped for. Scott on the other hand is very lucky and has experienced it twice, once with new machines and then again with workholdings. “I originally contacted Chick Workholding Solutions because I was tired of messing with steel vices from the stone age,” describes Scott. “I began to look at the concept of it being a workholding solution and not just a way to clamp a part. What really impressed me with Chick was how some of their suggestions didn’t make them any money.” Chick helped Scott deduce that instead of running the cam plate out of plate material and struggling to hold it accurately that they run it out of extruded bar on the lathe. They run it, flip it, run it flip it and hold .001 on thickness and +/- .00025 on parallelism. It then goes to the mill for critical boring. “The mill used to have a 4-sided steel vise setup,” explains Scott. “Now we have a 12-station Chick MultiLOK system for flexibility. The MultiLOK can easily change from dual station clamping, to single station, or Faceplates for quick change fixtures. The machine runs all day long. We reload it before we go home for lights out operation. The old setup was netting us only 8-12 parts per day, but now we get 36 consistently. There was no huge capital investment like buying a new machine, just a little retooling and rethinking the way we looked at the part. Needless to say, Chick really came through for us.” That set-in motion a plan to rethink of all their machines and how they were holding parts. Compared to a tombstone the Chick MultiLOK system gives Scott flexibility. He can easily change from dual station clamping, to single station, or Faceplates for quick change fixtures.